Who doesn’t love March Madness? Or really any exciting sporting event for that matter? Even if you’re not a super fan, it’s a great excuse to enjoy friends, family and food! While game time foods don’t always get the best nutrition reputation, there are plenty of winning options! One of my favorite new products is the line of Dannon®Oikos® Greek Yogurt Dips. These are slam dunk dips for your NCAA Championship Game party, mid-afternoon snack or spring barbecue appetizer. Who doesn’t love March Madness? Or really any exciting sporting event for that matter? Even if you’re not a super fan, it’s a great excuse to enjoy friends, family and food! While game time foods don’t always get the best nutrition reputation, there are plenty of winning options! 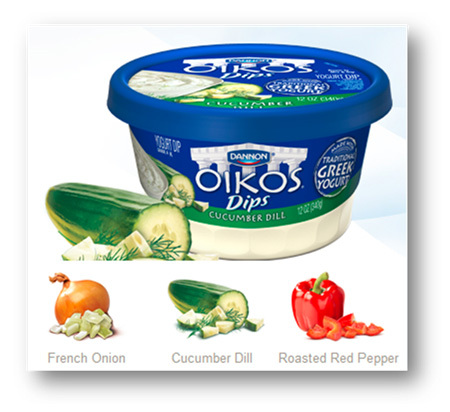 One of my favorite new products is the line of Dannon®Oikos® Greek Yogurt Dips. These are slam dunk dips for your NCAA Championship Game party, mid-afternoon snack or spring barbecue appetizer. What makes these dips a winner? The Greek yogurt base provides a rich, tangy taste and creamy texture for only 25 calories, 1g of fat and 2g of protein per 2 tablespoon serving (typical French Onion dip comes in at 60 calories and 5g of fat for the same serving size!). After trying each variety, I can’t pick a favorite! The French Onion pairs well with baked potato chips as a better take on a traditional treat. The Cucumber Dill has just the right amount of dill flavor and tastes fabulous with crisp cucumbers, carrots, sliced bell peppers or cherry tomatoes. I like to make my own pita chips to dip into the Roasted Red Pepper variety or spread on a sandwich as a mayo substitute. Which dip will you entertain this week, and what will you use as dippers? Feel free to leave a comment below! Looking for other game winning snacks? Checkout these awesome recipes for Sweet & Spicy Kiwi Salsa, Game Winning 7 Layer Dip, Peachy Black Bean Salsa and Three Layer Mexican Dip! French Onion Nutritional Information for 2 Tbsp. : Calories 25 Total Fat 1g (Saturated 0.5g, Trans 0g) Cholesterol <5mg Sodium 160mg Potassium 30mg Total Carbohydrate 2g (Dietary Fiber 0g, Sugars 1g) Protein 2g Vitamin A 0% Vitamin C 0%, Calcium 4% Iron 0% Ingredients: Cultured Grade A Milk, Water, Dehydrated Onions, Salt, Contains Less Than 1% of Modified Corn Starch, Sugar, Lemon Juice Concentrate, Natural Flavors, Modified Tapioca Starch, Onion Powder, Garlic Thyme, Yeast Extract, Pectin, Potassium Sorbate (To Maintain Freshness), Onion, Black Pepper, Sodium Citrate, Calcium Citrate. Contains Active Yogurt Cultures. 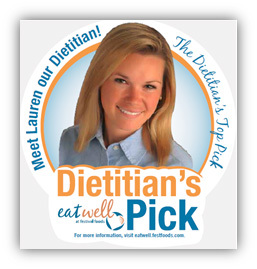 Cucumber Dill Nutritional Information for 2 Tbsp. : Calories 25 Total Fat 1g (Saturated 0.5g, Trans 0g) Cholesterol <5mg Sodium 135mg Potassium 35mg Total Carbohydrate 2g (Dietary Fiber 0g, Sugars 1g) Protein 2g Vitamin A 0% Vitamin C 0%, Calcium 2% Iron 0% Ingredients: Cultured Grade A Milk, Water, Cucumber Puree, Contains Less Than 1% of Salt, Modified Corn Starch, Dill, Lemon Juice Concentrate, Modified Tapioca Starch, Parsley, Sugar, Onion Powder, Natural Flavor, Sodium Citrate, Pectin, Yeast Extract, Potassium Sorbate (To Maintain Freshness), Garlic, Calcium Citrate. Contains Active Yogurt Cultures. Roasted Red Pepper Nutritional Information for 2 Tbsp. : Calories 25 Total Fat 1g (Saturated 0.5g, Trans 0g) Cholesterol <5mg Sodium 110mg Potassium 30mg Total Carbohydrate 2g (Dietary Fiber 0g, Sugars 2g) Protein 2g Vitamin A 0% Vitamin C 0%, Calcium 2% Iron 0% Ingredients: Cultured Grade A Milk, Water, Red Pepper, Roasted Red Pepper, Sugar, Contains Less Than 1% of Salt, Modified Corn Starch, Lemon Juice Concentrate, Modified Tapioca Starch, Parsley, Natural Flavor, Sodium Citrate, Onion Powder, Garlic, Yeast Extract, Pectin, Potassium Sorbate (To Maintain Freshness), Paprika, Calcium Citrate. Contains Active Yogurt Cultures.